Nestled in the picturesque hills of North Tustin, the Tustin Hills Racquet Club, the oldest private tennis club in Orange County, is currently in escrow to be sold to home developer Ranch Hills Partners. Located at 11782 Simon Ranch Road, the club was established in 1958 and has been a community jewel for 60 years. It features 11 championship courts, gym facility, pool and a banquet facility on roughly 6 acres located directly in the heart of the Tustin foothills. The club hosts USTA events as well as social gatherings such as weddings, birthdays and fundraisers for the community. Each summer, hundreds of kids take part in the weekly tennis camps and families enjoy pool memberships as a vital neighborhood amenity. North Tustin residents and the Foothill Communities Association (FCA) are uniting to oppose the rezoning and redevelopment of such an important landmark. The community most desires to see the tennis club remain intact for our families and generations to come. With a growing population of young families moving into North Tustin, preserving this valuable recreational space and amenity is of utmost importance. North Tustin is a unique and coveted community. Maintaining this important recreational and social space is critical not only to families but also to preserving property values throughout the North Tustin. 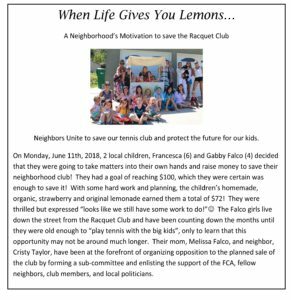 Shortly you will see “Save the Racquet Club” lawn signs throughout the community with information on how to stay informed and get involved. The FCA (fcahome.org) will also continue to be a valuable resource by providing for information and opportunities for involvement and support, as it remains committed to opposing any zone change for this treasured site. Lastly, We need YOUR help as the community continues to organize with several hundred concerned residents already coming forward. We are asking all of you to write into the Sentry and let us know how much the club means to you and your families. Please include your pictures and memories and any history that you have to offer and send a copy to FCA, PO Box 281, Tustin, CA 92781 or info@FCAhome.org . The FCA would also like to hear from concerned residents who may have constructive ideas for preserving the existing tennis club. Your voice matters! As neighbors, we are stronger together!